The National Identity Register (NIR), which was built to hold the fingerprints and personal details of millions of ID card holders, has been publicly destroyed. Around 500 hard disk drives and 100 back-up tapes containing the details of 15,000 holders have been magnetically wiped and shredded in line with Cabinet Office rules, and will soon be incinerated. 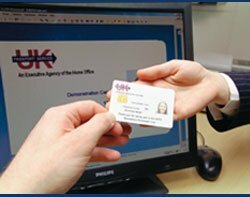 Home Office minister Damian Green said: "Laying ID cards to rest demonstrates the government's commitment to scale back the power of the state and restore civil liberties." In a written parliamentary statement it was recently revealed that the destruction of the NIR and the personal data held on the controversial ID card system will cost about £400,000.